Gainesville, Florida (WTVD) -- A texting fail is reminding a lot of people why it's important to double check a number before sending a message. A Florida police department is poking fun at the person who accidentally texted a cop asking for marijuana. 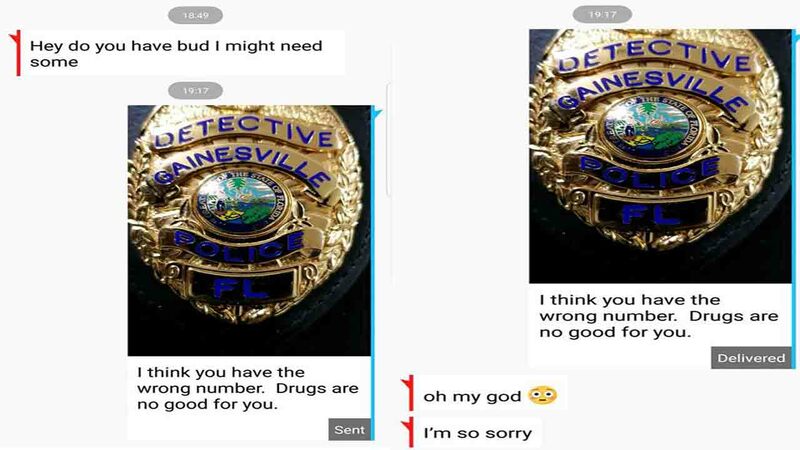 On Saturday, the Gainesville Police Department posted about the incident where an officer received a text saying, "Hey do you have bud I might need some." Clearly shocked that someone was asking them for drugs, the cop sent back a picture of their badge and said, "I think you have the wrong number. Drugs are no good for you." Immediately embarrassed, the sender responded, "oh my god. I'm so sorry." The department posted screenshots from the bizarre incident saying, "PSA: If you're looking to score drugs....please double check the number before you text. Also, drugs are bad, mmmkay?" So far, the post has been shared more than 1,600 times.